Plasma Jet is a private company developing and applying plasma technologies based on the method of DC arc jet. Passage of direct current through the gas causes its ohmic heating up to temperatures of 12,000 K. At such high temperatures the gas transforms into a partly ionized state called plasma. In the case of the DC arc jet method, plasma is formed between the hot cathode and the cylindrical nozzle as the anode. 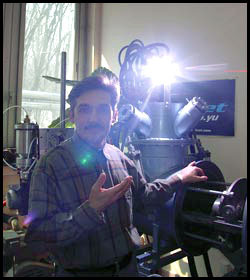 The jet of plasma is emitted from the nozzle with speeds measured in km/s. Since the heat content of the jet goes up to 20 MJ/kg of gas, this plasma jet serves as a large heat reservoir capable of melting anything injected into it, as well as for the activation of chemical reactions.